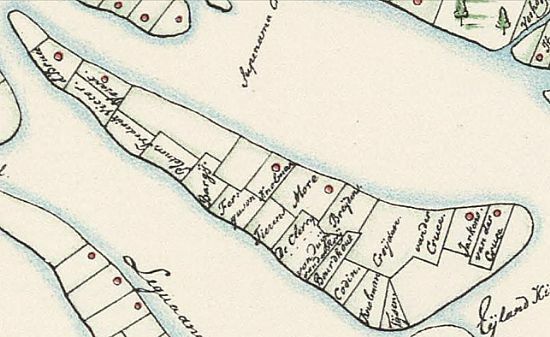 William Croydon's plantation on Wakenaam Island, Essequibo, can be seen in this detail from: Map of the Essequibo Colony, 1779 or 1780; Probably by A. Siraut - Destouches, Colonial Surveyor [David Rumset Map Collection]. In 1790 Croydon wrote to Thomas King of the slave trading company Camden, Calvert & King in London stating that ‘he has lost upwards of 70 capital slaves and has only 30 more goods’ [Hull Museums KINCM:2006.6923.34]. He also dealt with the Lascelles & Maxwell. He had a 'coloured daughter' Sophia Maria Croyden, who married Jacob Belgrave in the late 1780s [The Journal of the Barbados Museum and Historical Society, Volumes 46-48].